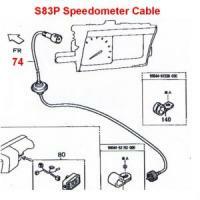 Daihatsu Hijet Speedometer Cable S82, S83. OEM: 83710-87D42 Note: Only (5) left in stock. Once Sold Out this item is discontinued. No further production planned. Daihatsu Hijet OEM Speedometer Cable S82, S83. Replacement cable is longer than original as cable was upgraded.